On the Plausibility and Purpose of Paul’s Sea Voyage in Acts 27 | Is That in the Bible? Like the climax of a novel, Paul’s sea voyage and subsequent shipwreck as a prisoner of the Roman centurion bring an exciting conclusion to Acts of the Apostles — a book that purports to tell a sweeping story of the church’s beginnings. To be sure, not a few Bible scholars past and present have regarded much of Acts as a fictionalized (or at least heavily embellished) account of the early church, and the final report of the Acts Seminar — a group of Bible scholars and historians that met regularly for ten years to share research on Acts — supports that conclusion. The sea voyage and shipwreck story of Acts 27, however, has long impressed readers with its attention to geographic and nautical detail. Even leading Acts scholar Richard Pervo, who devotes two chapters specifically to historical problems in his book The Mystery of Acts, describes the sea voyage as “vivid and apparently accurate” (p. 137). That is not to say he regards it as a historical event, since he elsewhere categorizes it as a “miracle story” (p. 110), but rather, that no obvious inaccuracies stand out. Leaving aside the issue of Acts’s overall historicity, I thought I would take a closer look at this particular story and see how plausible the shipwreck tale is. Despite the limitations of my meager nautical knowledge and the historical resources available, it’s been an interesting study. Furthermore, it has shown me (yet again) that historical concerns often lead us astray from what the text is actually trying to say. Because there is a significant amount of textual variation, particularly in the Western text tradition of Acts, I will occasionally include alternate variations and additions in brackets. The great sea voyage in Acts 27 is inextricably linked with the weather and geography of the Mediterranean. Numerous ancient writers described a safe sailing season that began in mid-March and lasted until late October or early November. Although winter navigation was not impossible, ships’ captains usually preferred to lay anchor in a suitable harbour during the hazardous winter months (Rickman 15). Sailing routes were governed by the winds and currents of the Mediterranean. 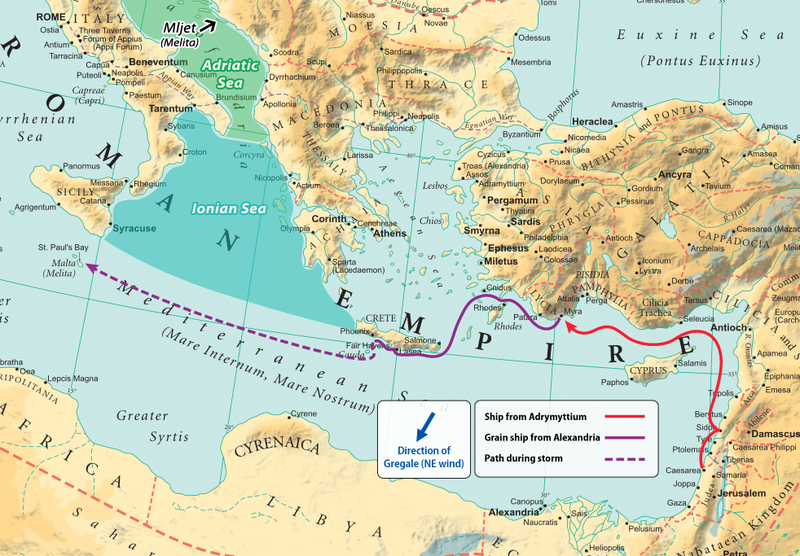 Taking a direct route from the southeastern Mediterranean (Egypt and Palestine) to Italy was nearly impossible, because both the dominant winds and the sea currents moved in a southeastward direction throughout that part of the Mediterranean. Instead, ships would ride the current in a counterclockwise direction, following the coastline of Egypt and the Levant to Anatolia (Turkey), where the currents began heading westward. By continuing to hug the coast, ships could then proceed to Greek waters and finally to Italy. Egypt, the breadbasket of the Roman Empire, supplied Rome with some 150,000 tons of grain each year. Enormous cargo vessels plied the waters of the Mediterranean throughout the sailing season, bringing wheat from Alexandria to the Italian ports of Ostia and Puteoli. These ships would inevitably follow the aforementioned circuitous route, spending at least a month on their journey (Beresford 83). The return trip took only half that time, as ships could sail directly southeast to Egypt, aided by both wind and currents. The economy of the Roman empire relied heavily upon the annual journey of the Alexandrian grain fleet. When it was decided that we would sail for Italy, Paul and some other prisoners were handed over to a centurion named Julius of the Cohort Augusta. We boarded a ship from Adramyttium about to sail for ports along the coast of the province of Asia, and we put out to sea. Aristarchus, a Macedonian from Thessalonica, was with us. So far, the route taken by Paul’s ship makes perfect sense given the currents and winds of the Mediterranean. The ship makes its way along the coast of Palestine and then Asia Minor, keeping to east of Cyprus. While Rome lies in a somewhat different direction, they are going the only way possible. It is curious that the text gives us the ship’s home port (Adramyttium), which has little bearing on Paul’s itinerary or other story details. As Adramyttium happens to be in the Troad region of Greece (i.e. Troy) near a famous location in the Iliad, Dennis R. Macdonald sees a deliberate allusion to Homer here (Macdonald 93). It is widely understood that the Alexandrian ship sailing for Italy must have been a grain freighter (especially given verse 38), and its route makes perfect sense if that is the case. It is somewhat unusual for it to be sailing alone and so late in the year, however. The Alexandrian grain ships normally sailed together as a fleet and left Egypt first thing in April when the sailing season began (Casson 297). A second run might take place in mid-summer, but other details in the story suggest it is already autumn. A difficulty I have encountered is that there are very few experts who publish on ancient Mediterranean seafaring, and in many cases, they assert historical facts on the basis of Acts alone. Since these writers are not specialists in the Bible, they tend to use Acts uncritically as if it were a firsthand account, so their conclusions are of little use in evaluating the historical plausibility of Acts itself — to do so would simply be circular reasoning. For example, Lionel Casson, who wrote the standard text on the subject, claims that grain ships sometimes sailed late in the year, but cites Acts as his only source for this claim (Casson 298 n. 6). A few items unrelated to seafaring we should note: (1) The use of the first-person plural “we” is literary artifice. It does not strictly fit the narrative in verses 1 and 6, since only Paul is being sent to Rome (Haenchen 697). This is also evident later when “we” is used for actions taken only by the sailors. (2) The reference to the Cohort Augusta may be anachronistic, since the earliest cohort known by that name was a Syrian cohort so named in 88 CE — several decades too late for our story, but perhaps closer to the author’s day (see Mor 37). We sailed slowly for a number of days and arrived with difficulty off Cnidus, and as the wind was against us, we sailed under the lee of Crete off Salmone. Sailing past it with difficulty, we came to a place called Fair Havens, near the city of Lasea. It seems the ship is making slow progress, and “the Fast” (Yom Kippur, which takes place in late September or early October) has already passed, so the end of the sailing season is not far off. The story suggests that the centurion was the one who decided to set out for Phoenix, taking counsel from the skipper and the owner rather than Paul. In reality, however, the centurion would not have been able to make nautical decisions (Haenchen 700). Many commentators also think it implausible that a prisoner such as Paul would have been involved in the discussions at all. In our story, however, he is given center stage for dramatic purposes. The identity of Phoenix is a subject of some debate, as is the description of a harbour “facing southwest and northwest”. (How can a harbour on the southern coast of Crete face northwest?) Strabo (Geography 10.475) located Phoenix near the modern Frangokastello, where the name Finikies apparently survives (Ogilvie 309), but there is no harbour there. Many scholars agree with a suggestion by Ogilvie which places it on a bay called Phineka¹ on the west side of Cape Mouros. The bay is unsuitable as a harbour today, but Ogilvie proposed that a series of sixth-century earthquakes had raised the coast level by some 13 feet. I looked and have found no record of earthquakes affecting Crete during the sixth century; but there was a major quake in 365 CE that uplifted the island by roughly that amount, which supports Ogilvie’s overall conclusion. Other scholars identify Loutro on the east side of the cape as the harbour in the story. The locations of Fair Havens and Lasea are less certain. Some scholars provisionally associate Lasea with a “Lasos” mentioned by Pliny (Nat. Hist. 36.4), but the passage in question does not actually associate Lasos with Crete. An inscription from Delphi mentions a Lassoia somewhere on the southern coast (see Plassart below). At any rate, we have no strong reason to doubt the accuracy of the geography in this section. There is a small island southwest of Crete that fits the description of Clauda here, although that is not precisely its name in ancient sources. Pliny called it Gaudus, and it is called Gaudos in modern Greek, Gozzo in Italian. Some biblical manuscripts call it Cauda. There is some potential for confusion here, since Strabo referred to Gozo (the small island beside Malta) as Gaudos (Geography 1.2.37). After hoisting up the lifeboat, the crew “undergirds” the ship. This is generally thought to mean that ropes were wrapped around the ship’s bow to reinforce it, although Haenchen and Beresford assert that such measures would have been useless for a Mediterranean ship with a keel and ribs (Haenchen p. 703 n. 1; Beresford p. 131 n. 87). The crew also lowers their “gear” — skeuos in Greek — overboard, but we don’t know exactly what this means.³ Some English translations read “sea anchor” as a guess, for this might have been a floating anchor designed to counteract waves and arrest the ship’s movement in a storm (Haenchen p. 703 n. 2). Some Western manuscripts add that the sails were furled, which would be understood anyway. The Syrtis is a bay off the Libyan coast known for being a shipping hazard due to shallow waters and lack of ports.⁴ Although it is in the right direction (southwest), it is 400 miles (600 km) distant and shielded from Paul’s ship by Cyrenaica, and Acworth (p. 192) agrees that the sailors’ fear makes no sense. However, the hazards of the Syrtis are alluded to in a few ancient sea storm tales, most notably the Aeneid, so perhaps it is simply mentioned for effect — to emphasize the dangers of the storm. Jerome Murphy-O’Connor (Paul: A Critical Life, p. 352) believes the text is disjointed at this point — a mixture of two separate travel stories that have been imperfectly harmonized. In vv. 13–17, the ship has taken shelter at Clauda, but in v. 18, it is again at sea, pummeled by the storm. They take advantage of being in Clauda’s lee to hoist the lifeboat on deck, only to then throw away their cargo and tackle? I admit, the situation is confusing. On the subject of cargo, it is not clear whether ancient grain freighters held loose grain in their holds or stored it in bags, but the former appears to be more likely. In either case, it is unlikely the crew could have opened the hatches during a rain storm to remove it. Some scholars think that only the baggage on deck was jettisoned, but others propose that the author has borrowed this detail from Jonah 1:5 (see references cited by Haenchen p. 704; also Praeder 691). To complicate matters, 27:38 a little later on describes the wheat being thrown overboard (again?) to lighten the ship. The storm continues for “many days” (fourteen, as we shall read further on), with storm clouds blocking out the sun and stars. Here too, we have a problem. The gregale is rare enough to begin with, striking in October only once every two years or so. Furthermore, this northeasterly wind usually only lasts a day or two; nothing close to fourteen has ever been recorded. And it is a cold, dry wind that brings clear skies and no precipitation (for all this, see Beresford, pp. 77-78). The description of Paul’s storm in Acts cannot be reconciled with the actual weather patterns of the eastern Mediterranean. At any rate, the story depicts a ship bereft of the tackle it needs for sailing, and with no sun or stars to navigate by even if its small storm-sail is intact. The situation could hardly be worse. For some reason, the crew’s refusal to eat prompts Paul to deliver an address, somehow, over the howling of the wind and the rocking of the ship, as if he were at the Areopagus. Praeder notes that this speech is not historically credible, but that it does conform to the conventions of literary storm scenes (Praeder 696). In his speech, Paul promises that everyone will be saved — an important key to this passage as we shall see further on. The odds of striking the only island in the vast open sea between Tunisia and Sicily, as opposed to the mainland, are remote (Haenchen 705). Is this something Paul heard from the angel, or is it his own prophecy? Pierpont Morgan Library. MS M.939, fol. 194r. After fourteen nights, the ship is adrift in the Adriatic Sea. There is some question of what body of water this name applied to in Antiquity, since the Adriatic is the sea between the Balkans and Italy, far from the events of this story.⁵ Even if it is taken to include the Ionian Sea, a ship approaching Malta from Crete would not really pass through it (see map below). However, it is interesting to note that description of the actual shipwreck toward the end of Acts 27 shares several details with Josephus’s own account of being shipwrecked in the Sea of Adria in Vita 15 while en route to Puteoli (see Smith 620), and the use of Josephus by Luke-Acts in other passages is now fairly well established. How the sailors suspected land nearby is not explained. One modern explanation is that they heard the distant breakers on the shore, but Beresford doubts that any sounds would have carried to the ship, since the wind was blowing in the direction of land rather than away from it (p. 189). Gilchrist agrees that breakers would not have been audible given the weather conditions (Gilchrist 41). …To leave a safely anchored ship at night in a lifeboat on a rough sea to get to an unknown shoreline, whose breakers could be beard, would have been outright stupidity. Only landlubbers could conceive such a suspicion. Furthermore, the centurion’s interference with nautical matters at Paul’s insistence dooms the ship, since they can no longer use the lifeboat to ferry passengers ashore (Ibid.). However, it provides another opportunity for Paul to assert control of the situation. At Paul’s urging, the crew and passengers eat for the first time in fourteen days. Even the most ardent literalist must admit that they could not have survived for two weeks without eating, and with food readily available, it is hard to account for such a fast. The cargo of wheat is tossed overboard (a second time? ), raising again the question of how the wheat was stored and how probable it is that the crew could have jettisoned the ship’s enormous load — hundreds of tons of wheat — by morning. The passenger count suddenly provided at this juncture reminds some readers of Josephus’s account, which also gives the number of fellow passengers (600) at roughly the same point in his shipwreck story. The “place of two seas” is generally interpreted as being a reef or similar sea hazard, but the actual meaning in Greek is unclear and disputed (see Gilchrist, 43-46). Many have attempted to identify the precise bay on the island of Malta where Paul landed using the meager details supplied by the story, but I won’t wade into that here. The Greek used to describe running the ship aground is a distinctly Homeric expression, as is the unique term used for the boat here (Macdonald 94). These terms are never used elsewhere in the New Testament or the LXX. To finish our analysis, we need to include the start of chapter 28. So after fourteen days lost at sea, the ship washes up on Melita, the ancient name for Malta. I think the problem here is more serious than most will admit. Malta is quite distant from Crete — some 540 miles (875 km) in a west-by-northwest direction. The apologist James Smith, writing in the 19th century, attempted to show mathematically that if the wind was coming from precisely the right direction, a drifting ship on a beeline for Malta could make it in exactly fourteen days. Gilchrist (correctly, I think) dismisses the validity of Smith’s arguments, calling them “statistical legerdemain, whereby Smith tried to draw precise figures from averages of rough estimates, themselves based on assumptions about unknowns.” (Gilchrist 40-41)⁶ Furthermore, the ship in our story was not purposely trying to navigate toward Malta; they couldn’t see the sun or stars to plot a course in the first place! And that they could make such good speed against the prevailing currents, with (at best) the small foresail, is all the more far-fetched. Assuming, with the majority of scholars, that the island described is Malta, we may ask how the narrator knows what the natives were saying to one another, since Malta was not colonized by the Greeks, and the locals would have spoken only Punic. The story even highlights this fact by calling the locals barbaroi. (See, for example, Haarman 17 and Jipp 39–43.) This is only a problem, however, if we assume that the narrator is actually a character within the story, and not an omniscient author crafting the story to satisfy theological necessity. We may also note that you cannot fit 276 people around a campfire; Paul’s fellow passengers and sailors just disappear from the story once they are no longer needed, like they had never existed. At this point, one might question the purpose of a shipwreck story whose details are historically problematic, in a book that intends to convey an important message about the early apostles. If we consider it theologically, however, there are intriguing connections between shipwrecks and criminal guilt in Greek legal and religious thought — connections lost on a modern audience. In a 1976 paper, Miles and Trompf bring up the Hellenistic beliefs that (1) misfortunes, especially those involving disasters at sea, were punishments meted out by the gods against the wicked, and (2) even the innocent could be “polluted” by association with the guilty and share their fate. One such example even shows up in the Hebrew Bible — that of Jonah, whose relevance to Acts 27 has already been noted. Although the introduction of the Dioscuri into the story seems like an incidental detail, their mention might influence the reader’s perception of Paul, much like an incident earlier in Acts where Paul was identified by local townsfolk as Hermes, the “bringer of good news” in Hellenistic belief. (See my earlier article, “Ovid’s Metamorphoses and the Gospel According to Hermes”, for more on that story.) The Maltese identifying Paul as a god appears to be a deliberate callback to the Hermes incident, and the author’s technique of interpreting the Christian mission through Greek (pagan) religious motifs is again evident. Despite the great attention to detail and the gripping mise-en-scène nature of the story, there are many aspects of the shipwreck story that strain credibility. Quite a few scholars have attempted to fix the narrative, either by separating it into separate source texts (e.g. Boismard and Lamouille) or by proposing numerous interpolations and embellishments that draw upon classical sources like Homer and Virgil. My own impression is that the author has used a genuine description of a sea voyage for part of the story — particularly the initial portion leading up to the storm and the search for a harbour at Crete — that wasn’t necessarily even about Paul in the first place. After that, the story seems much more contrived, inventing a dramatic but implausible tale of calamity and survival that demonstrates Paul’s divine favour and innocence in thundering fashion. While we may enjoy the story for its own sake and root for the hero Paul as he continues to minister to those around them while courageously facing his fate in Rome, a skeptical eye is also required for those of us who are honestly curious about the historical Paul and cautious about using scripture as a history textbook. It is also essential to seek out the story’s theological intent and consider it in its ancient religious context if we want to hear what its author is trying to say. “Did this really happen?” is often a question worth asking, but “Why did the author write it this way?” is just as important. It’s always possible in situations like this that the locale’s name comes from the biblical story rather than vice versa. There is, however, an inscription of unknown date found in North Africa which names all the winds, including a northeast wind called Euraquilo. Most commentators appear to be unaware of it. Once again, the use of “we” is clearly a literary motif here, since obviously Paul and his companions are not tending to the ship’s tackle and gear. In fact, there are two Syrtes. The second one is even farther away, near Tunisia. Pomponius Mela, writing in the mid-first century, describes the Adriatic Sea just as it is defined today in his De Chorographia, 1.17. Strabo and Ptolemy define it similarly. Nevertheless, Gilchrist declares the shipwreck narrative to be a “matter of fact” and “not a literary invention” in his conclusion, despite having refuted the only widely-cited effort to establish the plausibility of the ship’s course, and offering little supporting evidence other than the use of “we” and the story’s attention to detail. One cannot help but be reminded of the long ending of Mark, in which the ability to withstand venomous snakebites is promised to believers. The association of Mljet with Paul’s Melita goes at least as far back as tenth-century Byzantine Emperor Constantine VII Porphyrogenitus in De Administratione Imperii 36. 7th-century Armenian scholar Anania Shirakatsi allegedly also located Paul’s shipwreck at Mljet in his Geography (source), but I cannot read Armenian and have not located any academic references. Dennis E. Smith and Joseph B. Tyson, Acts and Christian Beginnings: The Acts Seminar Report, 2013. James Beresford, The Ancient Sailing Season, 2013. Lionel Casson, Ships and Seamanship in the Ancient World, 1971. Geoffrey Rickman, The Corn Supply of Ancient Rome, 1980. Susan Marie Praeder, “Acts 27:1-28:16: Sea Voyages in Ancient Literature and the Theology of Luke-Acts”, Catholic Biblical Quarterly 46/4. Robinson Smith, “Fresh Light on the Synoptic Problem: Josephus a Lukan Source”, American Journal of Theology 17/4, 1913. J.M. Gilchrist, “The Historicity of Paul’s Shipwreck”, JSNT 61 (1996). R.M. Ogilvie, “Phoenix”, JTS n.s. 9 (1958). Menahem Mor, The Second Jewish Revolt: The Bar Kokhba War, 132–136 CE. Dennis R. Macdonald, “The Shipwrecks of Odysseus and Paul”, NTS 45 (1999). Acworth, “Where was St. Paul shipwrecked?”, JTS 24/1 (1973). Jerome Murphy-O’Connor, Paul: A Critical Life, 1996. Joshua Jipp, Divine Visitations and Hospitality to Strangers in Luke-Acts: An Interpretation of the Malta Episode in Acts 28:1-10, 2013. Harald Haarman, “Ethnicity and Language in the Ancient Mediterranean”, A Companion to Ethnicity in the Ancient Mediterranean, 2014. David Ladouceur, “Hellenistic Preconceptions of Shipwreck and Pollution as a Context for Acts 27-28”, HTR 73, No. 3/4 (1980). Gary B. Miles and Garry Trompf, “Luke and Antiphon: The Theology of Acts 27-28 in the Light of Pagan Beliefs about Divine Retribution, Pollution, and Shipwreck”, HTR 69 (1976). André Plassart, “Inscriptions de Delphes, la liste des Théorodoques”, Bulletin de Correspondance Hellénique 45 (1921), pp. 1-85. James Smith, “Dissertation on St. Paul’s Voyage from Caesarea to Puteoli on the Wind Euroclydon and on the Apostle’s Shipwreck on the Island Melite”, The Classical Journal Vol. 19, 1819. Boismard and Lamouille, Les Actes Des Deux Apotres. Tome III: Analyses Litteraires, 1990. A. Breusing, Die Nautik der Alten, 1886. I did a much briefer study on this a few years ago, and found a passage in which a man is doomed to die at sea, but then escapes. When he makes it ashore, he is immediately bitten by a snake and dies, punishment for escaping his original fate. The detail in Acts of Paul surviving a snake bite at the same point suggests that Paul’s onlookers (the narrator’s readers) would have needed this extra reassurance of his innocence. Sounds like Acts contains a watered down beta draft of Sindbad to me. With a large experienced sea captain & crew and Roman military officers being present just why is a prisoner like Paul able to repeatedly take control of everything from meals to navigation unless he’s just a fictional hero? And is there any reason a political prisoner would have been brought to Rome instead of just crucified where he committed his crime like oh, Jesus, was supposedly? Yes, that’s part of the problem. Paul was supposed to be a prisoner, not a guest of honour. Boismard and Lamouille, who I briefly mentioned above, believe two different sea stories have been combined — one in which Paul is a prisoner, and one in which he is a free traveler. Have they offered any kind of reconstruction (even partially) of the two? Intersting points! I didn’t realize there was a suggestion that “Malta” was actually referring to another island. That suggestion makes a lot of sense. The author of Acts doesn’t seem to have a problem recording things allegedly said in obscure languages. This is clear from 14:11, which records words people said in Lycaonian. One thing I noticed about the Malta story is that nowhere does it mention Paul preaching to the Maltese. It says what the Maltese said to *each other*, but does not mention the words of any conversation between the Maltese and Paul (or his companions). Nor does it say that Paul and co picked up any followers there, although the people there showed “hospitality” and “kindness.” I would suggest that the author was indeed subtly hinting that there was indeed a language barrier between Paul and the Maltese. The snake story may have been a way to show how Paul was able to win over the Maltese without talking to them or formally converting them. Excellent article! I suspect that Luke was trying to fulfill Paul’s complaints from 2 Corinthians 11:23-26. He didn’t get around to the lashings of verse 24, but there are several examples of dangers from Jews, gentiles, cities, and wilderness. Thanks, Greg. That makes sense to me too. I read about another localisation oft Acts’ Malta recently: The Ionic Island oft Cephalonia. Heinz Warnecke, “Die tatsächliche Romfahrt des Apostels Paulus”, 1987, Katholisches Bibelwerk. It’s a Dissertation St the Universität oft Bremen, Germany. Edit: Having investigated this a bit, it appears that Warnecke’s thesis rests on his assertion that island of Cephalonia — or at least part of it — was called Melite in Argonautica, and that was therefore one of its names in Antiquity. He is incorrect, however. The Melite in Argonautica is associated with Liburnia, i.e. Dalmatia, and is therefore Mljet. The odd thing I noticed: Paul says, “none of you will lose a hair from your heads,” and tells them to eat. Then “all of them were encouraged,” and ate. This seems to imply that Paul has persuaded them, that they accept Paul’s revelation. Clearly, the sailors did not believe Paul, even at that stage, or else they wouldn’t be throwing money away. I think the way it’s supposed to be taken is that the crew expect to survive by running the ship ashore, so they need to lighten the cargo hold. But ironically, this is only necessary because Paul just had the centurion cut away the lifeboats. There is a textual variant of Acts 27:37 which says “76,” but judging from the manuscript evidence, “276” appears to be original. Even the NIV says “276,” without so much as a footnote. Below is from http://www.ovc.edu/terry/tc/lay13act.htm. Does Josephus report his voyage and shipwreck in the first person plural too? At the time when Felix was procurator of Judea there were certain priests of my acquaintance, and very excellent persons they were, whom on a small and trifling occasion he had put into bonds, and sent to Rome to plead their cause before Caesar. These I was desirous to procure deliverance for…. In addition to the similarities already mentioned, the impetus for the sea voyage in Acts is the same as that in Josephus’s autobiography. An arrest that takes place under procurator Felix leads the wrongly accused to travel to Rome to plead their cause before Caesar.